Robert Levy is a Harvard graduate subsequently trained as a forensic psychologist. He is also an award-winning playwright, having multiple shows developed Off Broadway. His work has been called “frank and funny” (Time), “idiosyncratic and disarming” (The New York Times), “ambitious and clever” (Variety), “smart” (Fantasy & Science Fiction magazine), and “bloody brave” (SFX magazine, UK). "As imaginative and frightening as a whole gallery of surrealist paintings come luridly to life." "A luscious, compelling tangle of a thriller. The Glittering World maps the realms of friendship and identity, the mythic and the contemporary. I loved it." "Fast paced, yet it also succeeds as a reflective tale of self-discovery...Well crafted, atmospheric, and whimsical, this will attract readers who enjoy Neil Gaiman and Mark Z. Danielewski." "The Glittering World is a stunning phantasmagoria drawn from the world just beneath the surface, aswarm with great and memorable characters and a plot that twists and turns as it hurtles forward. A grand debut. One taste, and you'll be addicted." "Levy's first novel is confident, brave, and beautiful in every way, with resonant warmth and an understanding of the fundamentally singular human experience." "Emotionally complex… Levy’s atmospherics are all encompassing, and fantastic. A darkly romantic, lovely, sometimes horrifying, and yes, glittering read." "Frightening and supernatural . . . the imaginative plot is first rate." "Robert Levy spins a dark and mythic tale. Exquisitely allegorical, this novel seethes with menace, romance, and mystery. 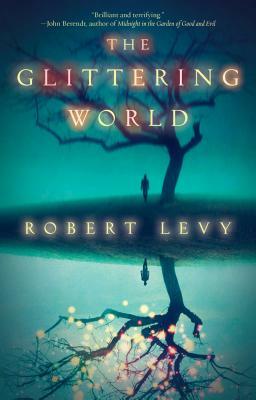 The Glittering World is a powerful debut." "Robert Levy's transcendent first novel balances on the knife-edge between psychological horror and mainstream thriller — [it] deserves a place beside that of Peter Straub, Graham Joyce, and Mark. Z. Danielewski." "Imagine True Blood crossed with Margaret Atwood. As seductive, fantastical, and menacing as any modern supernatural classic." "The Glittering World is that rare and wonderful kind of book that takes something old and makes it new again. Like those who disappear into the woods in this novel, once you step into these lush and mysterious pages, be prepared to return to your own world altered." "The Glittering World is that rare thing: A literary novel that reads like a thriller. A fairy tale for the modern era."